The forecast called for cooler temperatures and rain, of course, for our next bit of hiking (just like the Kiso Valley) in Koyasan, a two-hour journey from Osaka. We took the Nankai Line’s Limited Express (a bit like a commuter train or long distance subway) to Hashimoto Station, then hopped on their local bus out of the city into the mountains to Koyasan, where we took a short local bus to our temple stay at Ekoin. 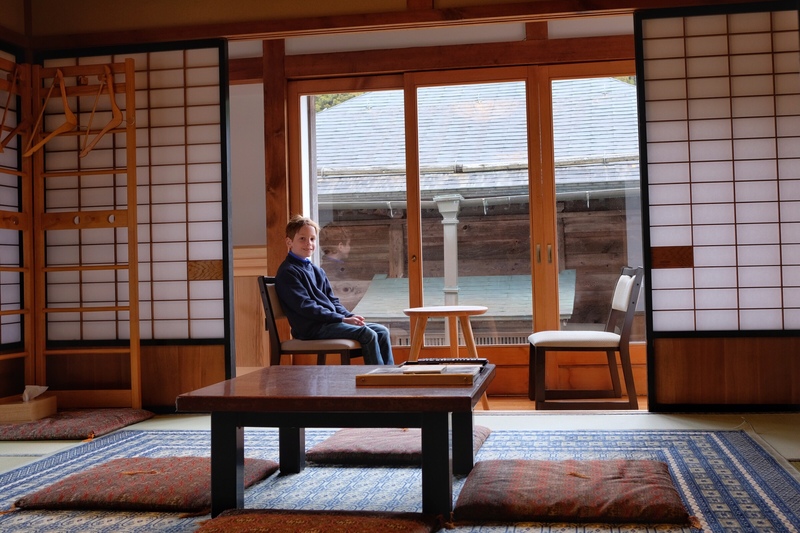 Rowan sitting in our traditional Japanese room at the Ekoin Temple. 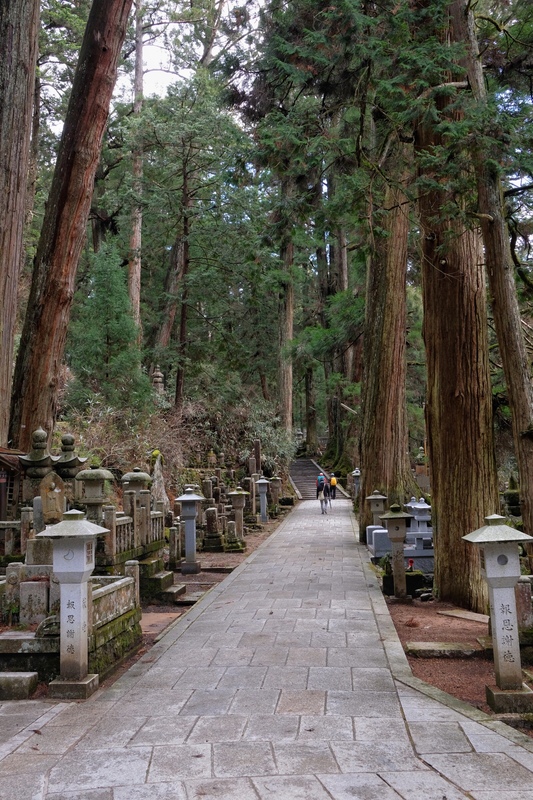 After checking in, we walked down the main street and crossed a short bridge into Okunoin Cemetery, which runs for two km through a forest of Japanese cedar trees that range from 200 to 1,000 years old. The cemetery has been around for over 1,000 years as well and is the resting place for monks in the Koyasan area, wealthy benefactors and anyone else who wants to be entombed there, Buddhist, Shintō, or otherwise. Walking along the path of Okunoin Cemetery. It’s a magical place. Shafts of sunlight struggle to reach down through the trees and touch the moss covered ground, damp funerary statues and monuments, and the wide stone path that stretches the entire 2 km to the mausoleum at the end. All along the path, deteriorating stone steps lead up or down to grave sites, and a thin stream follows on one side of the path, bringing a steady flow of water that empties out in a small river crossing the path at about the half way point, under the second stone bridge. It’s incredibly quiet and while we walked all we could hear was the roaring of the wind through the very tops of the cedars, about 100 feet in the air. 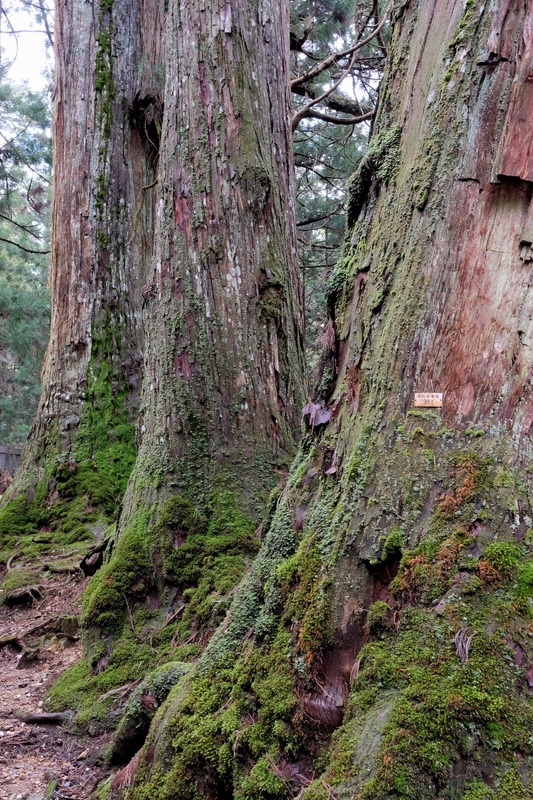 The oldest trees in Okunoin Cemetery have been numbered. Reluctantly, we turned back after the second bridge to return to Ekoin for a 4:30 pm meditation session in the Meditation Hall. The lovely monk who led our 20 minute meditation, told us about the importance of Ajikan meditation, and the moon, the lotus flower and the Sanskrit letter for “A”, that makes up the symbol for the Shingon school of esoteric Buddhism, founded by Kobo-Daishi. The moon represents the changing nature of the mind, which starts off full for every human, bright and clear. Daily life changes the mind in a constant cycle, like the moon, obscuring it from the sun (the Cosmic Sun Buddha), making it shrink and darken, before returning back to its state of fullness, brightness and clarity. The lotus, grows in dirt and mud, but when it’s flower blooms, it’s completely clean and free of any mud, representing the desire to achieve enlightenment. The Sanskrit letter “A” symbolizes Dainichi Nyorai, the Cosmic Sun Buddha, the supreme Buddha in Esoteric Buddhism. 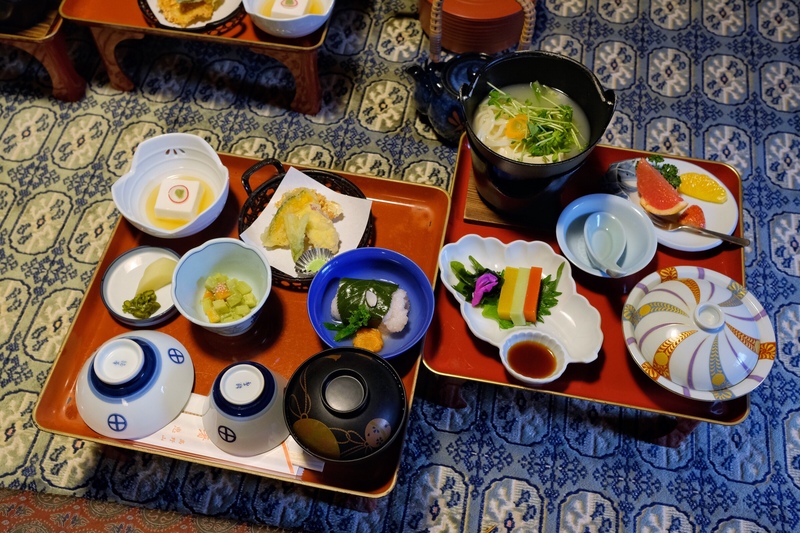 After the meditation, we went back to our room, where monks brought our vegetarian dinner on little trays, along with a pot of rice and a pot of tea. There were several delicious tofu dishes, pickled vegetables, and a main soup with soba noodles, more tofu and a miso broth. Amazing. Our Buddhist vegetarian dinner served in our room. After dinner, the monks came to clear things away and set up our beds on the tatami mats, while we headed out with about 20 other tourists in the rain for a night walk in the cemetery, accompanied by yet another monk, who was our guide. Before crossing the first bridge this time, our guide asked us to bow and say a small prayer for Kobo-Daishi. He told us about the stone monuments representing the five elements of the universe that you see all throughout the cemetery: a cube on the bottom (representing the earth); topped by a sphere (water); followed by a flattened cube with its top four corners pointing up (fire); a bowl shape (wind); and a slightly flattened sphere with a short tail pointing up in the middle (sky or space) on top. 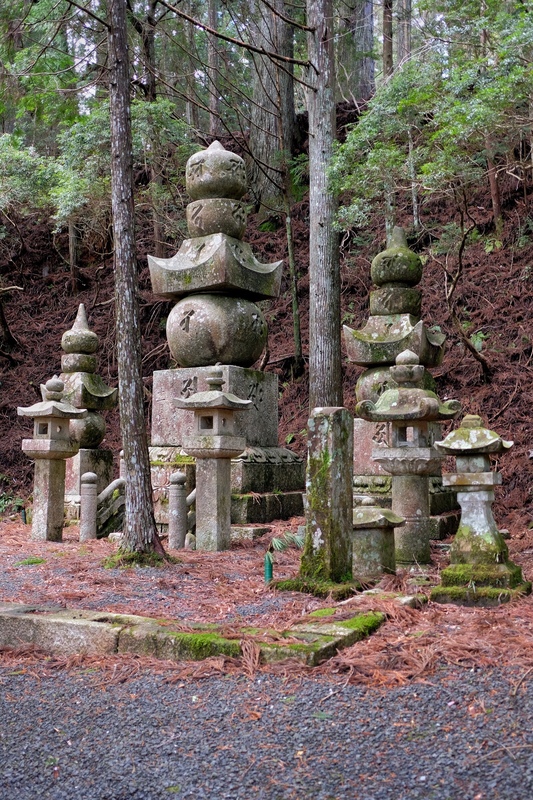 Stone monuments representing the five elements of the universe. He also told us about why there are so many small square monuments in the cemetery. They house the throat bone of the deceased, which looks like a seated Buddha. Along the path at regular intervals were tall stone lanterns, emitting bright yellow-orange glows and lighting our way to the Mausoleum including little moon shaped holes in the sides, sometimes crescent shaped, sometimes full moons. 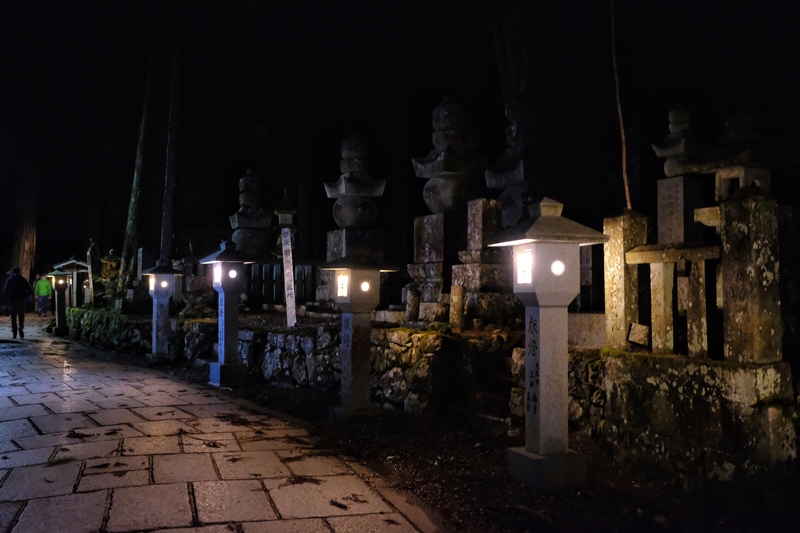 The lanterns lit in Okunoin Cemetery during our night walk. Near the end of the path, our guide pointed out two buildings that are the kitchens for the monks who prepare food twice a day, at 6:30am and 10:30am, and deliver it to Kobo-Daishi as he rests in eternal meditation in the Mausoleum. Before crossing the last bridge, we bowed again and said a small prayer for Kobo-Daishi, and then walked up the stairs to the Mausoleum, which has hundreds of lit lanterns hanging from the eaves, glowing bright orange in the night. Our guide took us to the back of the building, to the tomb of Kobo-Daishi, explaining that after he entered eternal meditation in 835 AD, a monk entered the Mausoleum in 921 AD and saw that Kobo Daishi’s hair and beard had grown, so he trimmed them and dressed him in a new robe. Since then, no one is allowed to enter Kobo-Daishi’s Mausoleum, except the head monk of the cemetery. After bowing one last time in front of his shrine and saying one last prayer, we returned to the path and walked the 2km back to our room at Ekoin Temple, where the room was warm and the cosy beds were all ready for us. How did you find these incredible places? Did the monks speak English? It looks like you selected some special places. We found out about Koyasan just in researching things to do in and around Osaka, including a travel article we’d read about Ekoin temple. We fell in love with the idea of a mountain temple stay so we googled it and booked it. We knew about the temple ceremonies and the meditation class, but the cemetery was a beautiful surprise. The monks do speak English, as I think staying in Koyasan is more popular for foreigners than it is for Japanese tourists. There was a Japanese tour of the cemetery at the same time as ours, but it was for just a handful of people, whereas the English tour had a pretty large group. Our stay there was incredibly special and we’ll definitely visit it again (and stay longer) the next time we go back to Japan.